Our composers have great title pages! One of the early ideas associated with our Den of Death program was the concept of indulgence: indulgence in revelry, flesh, fantasy, and the practice of purchasing indulgences to avoid temporal punishment for sin. Viet Cuong‘s piece Windmill works in these themes, while creating a unique and very successful blend of our four instruments! Read what Viet has to say about his piece below, and then get your tickets to Den of Death! I was born and spent the first four years of my life in southern California. Though I was quite young and don’t recall many memories of living there, I (for whatever reason) do remember looking out the window of the car and admiring ranks of windmills perched on the hills by the highway. Perhaps this memory was ingrained in my brain simply because it was so stunning; watching a hundred windmills spinning their blades in conjunction with the rolling wind is quite a sight. They’re modern marvels—and strangely statuesque. For years I would think back to this memory, and I knew I had to write a piece with it in mind one day. I thought that the instrumentation of the Cadillac Moon Ensemble would work very well with the “windmill” concept: the idea of four different instruments driven by a single, common force resonates quite nicely with what I mentioned above. However, when I learned that the concert would be themed around indulgences, I wondered if there was a way to bring another conceptual level to the piece. 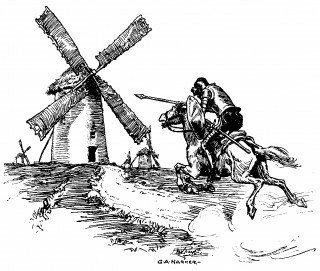 More memories then came to me…this time of my high school literature classes, when we studied George Orwell’s Animal Farm, where the windmill symbolizes power and manipulation, and Miguel de Cervantes Saavedra’s Don Quixote, where the windmill represents Don Quixote’s indulgences in fantasy. As luck would have it, I then remembered more instances of windmills in my college life. At Peabody/JHU I took a course on French and German cabarets at the turn of the century. 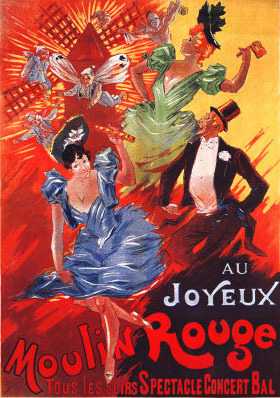 The Montmartre area of Paris was (in)famous for its cabarets during those years, and the area’s windmills, especially at Moulin Rouge and Moulin de la Galette, became iconic motifs of the cabarets. 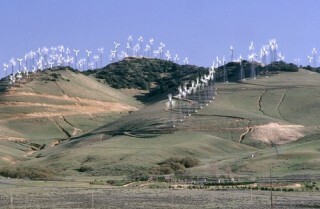 These windmills for me represent indulgences of revelry and flesh. Windmill is therefore a unifying piece for several reasons. It brings together many slices of my life, as well as the quirky, unconventional instrumentation of the CME. Because the four instruments of the ensemble have such distinct characters, I thought it would be a fun challenge to meld them into a “single instrument,” and other times create a “fiolinophone,” “cellophone,” or “vibraphlute” by combining two or three of the instruments. The main motif, borrowed from a piano piece I wrote last year, sits on an A and flows perpetually through the entire work. As the motive is passed through each of the four performers, the surrounding landscape’s harmonies and textures subtly shift. It’s almost as if the motif recalls wind flowing through a row of four windmills. Thank you so much to Roberta, Patti, Meaghan, and Sean for everything they do, and for their remarkable patience and trust in me as I was writing the piece. It will be an honor to have them premiere it this week! Matt Marks was the first composer we thought of when we came up with our Den of Death program concept. When you hear his piece, you’ll know why! Meaghan Burke, our cellist, sits down with Matt (and virtual Japanese pop star Hatsune Miku) to discuss his new work KAMIKAZE KARAOKE that we commissioned. We’ll be premiering the piece on December 20th at The Cell Theatre in New York! 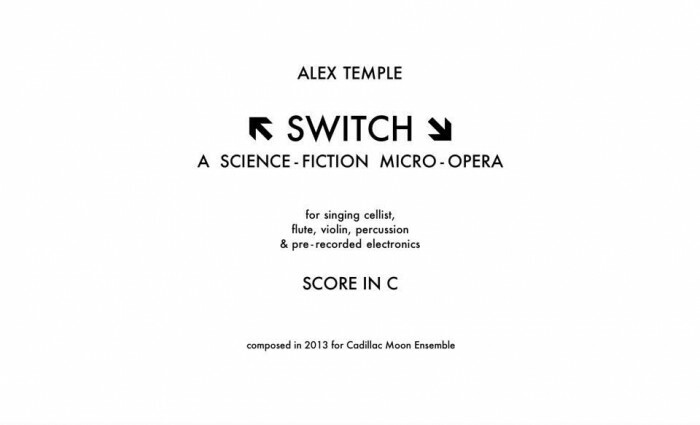 We’ll be premiering Alex Temple‘s Switch: A Science-Fiction Micro-Opera on our Den of Death concert at The Cell in New York City on December 20th. Come check it out! We sat down (via the internets) to ask Alex a little bit about the piece. Can you talk/write a little bit about your process in developing the libretto/story of this piece? I found it really exciting to hear your different ideas as they developed before you began composing, and would love to hear the story behind the story again! I’d actually been thinking for a couple of years about writing something set in a parallel universe where the most basic social division was between right- and left-handed people, with a protagonist who was “trans-handed” — born as a righty, but living and identifying as a lefty. I never thought it would be a piece of music, though. I had always imagined it as a short story. When Meaghan asked me to contribute a piece to the “Den of Death” show, I knew I wanted to write something involving trans politics, both because it seemed thematically appropriate for a concert that was originally conceived as a response to a set of sexist liner notes, and because it’s a topic that’s often on my mind. 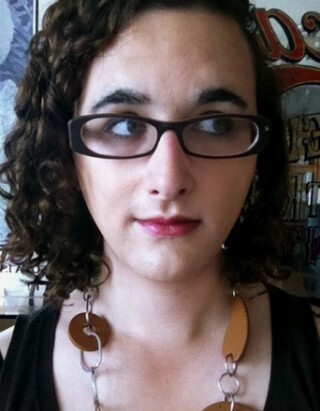 For a while I was thinking of taking some kind of horrible transphobic screed, like some of the things Susan Stryker quotes in her book Transgender History, and giving it an abrasive, sarcastic setting, but Meaghan and I both felt that putting that kind of text in the mouth of a singer who wasn’t herself trans didn’t seem like a great idea. Once I decided to use my sci-fi story idea for the piece, things came together pretty quickly. As soon as I wrote the first lines — “I have a confession to make: I was born right-handed. Does that shock you? I realize that my telling you this is dangerous…” — it became clear that this was not just a stratified society but a dystopian one, and the darker, more violent aspects of the story developed from that realization. Along with that, when did the 1960s come into the composition? That happened more or less by accident. One of the first ideas I had was for a scene in which the protagonist reminisced about having lived in a commune with a bunch of other misfits, during a brief period of liberalization preceding a crackdown. At some point it occurred to me that this was really a more extreme version of what happened after the 60s and early 70s in our own world: the liberated society that must have seemed like it was just around the corner never materialized. I remember reading Ursula K. Le Guin’s The Lathe of Heaven a year or two ago, and one thing that jumped out at me was that Le Guin, writing in 1971, expected businessmen of the future to sport shoulder-length hair and goatees. That must have seemed pretty plausible at that point in history. Instead we got Reagan, yuppies and privatization. That’s not as bad as a tyrannical dictatorship that commits mass murder and burns a third of the country to the ground, which is what happens in Switch, but it’s still a far cry from peace, love and understanding. Was the piece influenced by any specific composers or styles of music? For sure. Like a lot of my other music, Switch uses style as a kind of iconography. For example, the brief period of liberalization I mentioned is associated with the optimistic sound of early-60s advertising and film music, and passages involving the utopian Free Zone allude to psychedelic rock, folk and soul. (See if you can spot an orchestrational quote from “Strawberry Fields Forever”…) Even the atonal passages were inspired by music from the same period; while I was working on the opening, I spent a while studying the score for Berio’s Laborintus 2, which is an old favorite of mine. For the most part these styles are freely intermingled, distorted, and linked together through melodies and rhythms that appear in multiple guises. It’s not all 60s, either. Kurt Weill is always just around the corner, because I love him and I don’t think I could write a piece of satirical political music-theater without him watching. There’s also a passage which was inspired by the monotone singing in Robert Ashley’s operas. It’s sung by a “right supremacist” zealot, and since in this universe, creativity is seen as the domain of the left-handed, I figured it would make sense to have the character sing in a speech-like style with little variation in pitch. What role, if any, does politics play in your music? Do you feel that composers/musicians have a general responsibility to engage with political issues? “Responsibility” seems too strong to me. Not everyone has the inclination or the right personality to make good political art, and I think it would be a boring world if people stopped making things whose only purpose was to be beautiful or fascinating. I’ve actually been hesitant to address political issues explicitly in my work, because there’s such a danger of being heavy-handed, even if you’re doing allegory rather than direct protest (see: Animal Farm). Switch is by far the most political piece I’ve written, and at this point I’m still too much inside it to know whether or not it manages to avoid that trap. My hope is that it’ll work by virtue of the sheer weirdness of its tone, which is often goofy and tragic at the same time. I guess we’ll find out at the premiere! We just received the scores for two new pieces for our Den of Death concert coming up on December 20 at The Cell, and we can’t wait to get started rehearsing them! 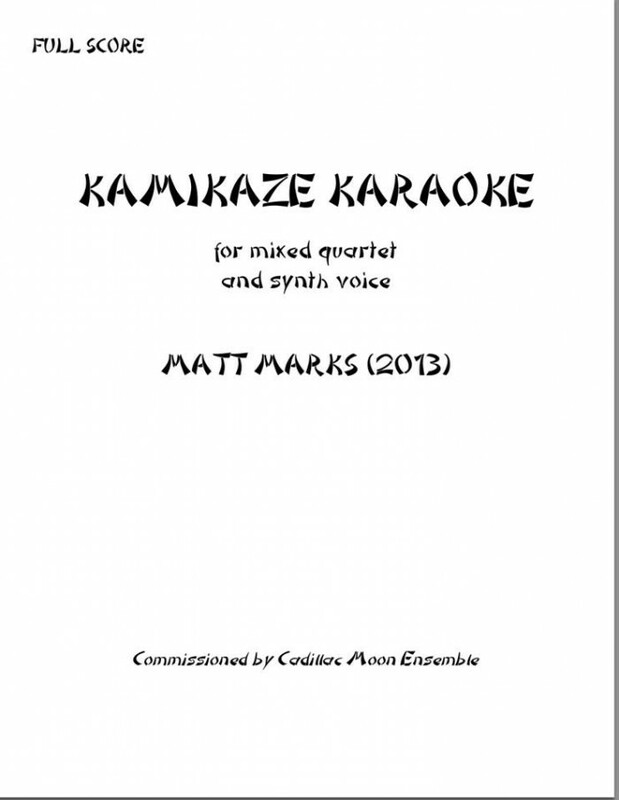 Stay tuned to learn more about the pieces from the composers themselves, but for now check out the title pages of Alex Temple‘s Switch: A Science-Fiction Micro-Opera and Matt Mark‘s Kamikaze Karaoke. If you like what you see, please consider donating a few bucks by October 25 with our IndieGoGo Campaign to raise money for this season! Watch the live stream at 6pm! 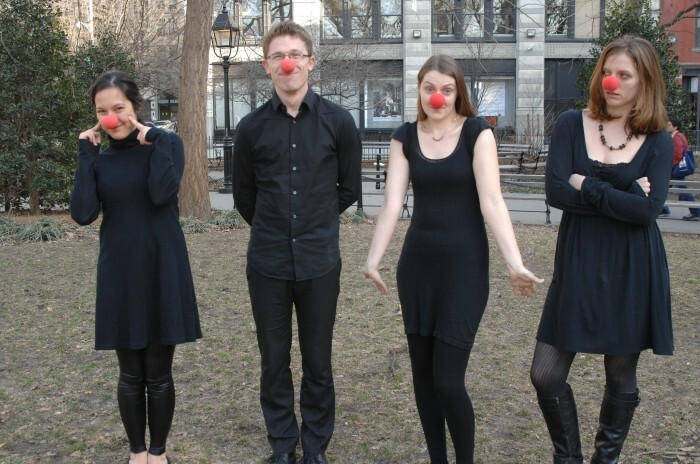 Cadillac Moon Ensemble is holding an open rehearsal with composer collective Circles and Lines at New York University today at 6pm. Watch it here! I’ve always been a little afraid of the circus. Clowns have always scared me more than just about anything, as have freak shows and tests of strengths. But the truth is I’ve been to very few actual circuses—only one, in fact, and that recently, and I went with my toddler who delighted and then slept and the whole thing was harmless and actually fun. But the horror persists. My own visions come from movies like Shadows and Fog, Dumbo and The Elephant Man; and from books like Geek Love, Wonder When You’ll Miss Me, and of course looming largest, Ray Bradbury’s Something Wicked This Way Comes. When I was a kid, I remember thinking the novel was about being old; as an older person, I now understand the book is about being young. Either way, it continues to scare the life out of me. The movement titles of my Something Wicked (I. “The Maze Does Not Ask” and II. “The Maze Does Not Tell”) come from the text of the book, and while I only vaguely understand what they mean—something about aging and play and the fear of losing what is dear to a child, of giving up childish things—I think perennial questions with inconclusive and open answers can only be properly asked in musical terms. So both movements are in odd versions of the rondo form, a form in which things materialize and re-materialize, but more are my iterations of the books central Carousel, wherein grotesques appear and re-appear in a somewhat-sadistic loop. The surface of the first movement is Britten-like in its irony (the decorousness belies deep, dark subterranean activity) and the surface of the second is sad and pretty and also masks black depths. And the carousel keeps going around and around and around. It always does. 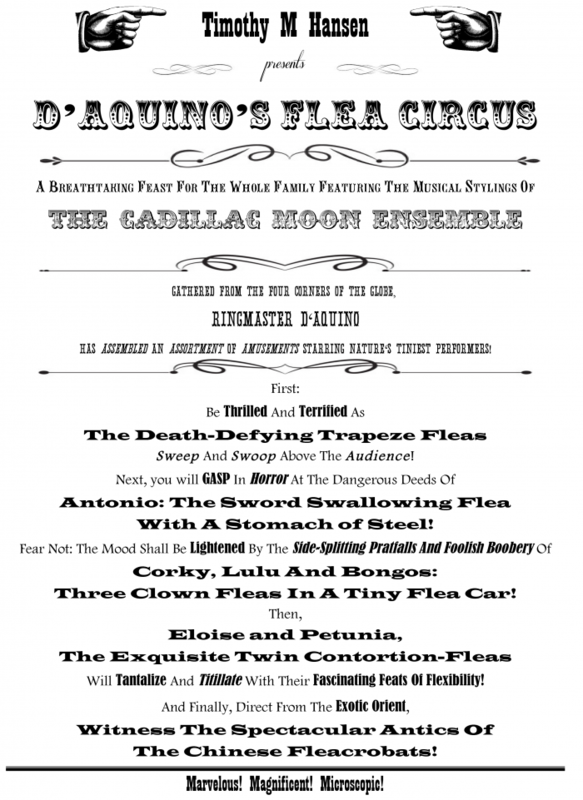 We’re just a few days away from our Dark Circus concert on Friday! In preparation, we’ve asked some of our composers to talk about how they interpreted the Dark Circus theme and their process of writing for CME. I inspire awe with my super(sub)human feats of …strength? I love circus music. I always have. When I think of circus music, I think old school. I think of a boozed up, ramshackle, barely-held-together group of misfit musicians bleakly lurching their way through dark waltzes while a family of Italian trapeze artists hurl themselves around high above their heads. I think of years of roaming from town to town in a series of decrepit wooden caravans, being cautiously welcomed by the townsfolk long enough for the performers to set themselves up, do their thing, and then get the hell out of town. I think of the “other-worldliness” that circuses never fail to evoke – this whole bizarre world of bright colours and sideshow alleys and death defying feats and freaks and carneys and weird, weird music all living underneath a tent that can evaporate overnight, leaving behind a few sad ticket stubs and the lingering odour of popcorn. It’s romantic and disturbing. Just how I like things to be. 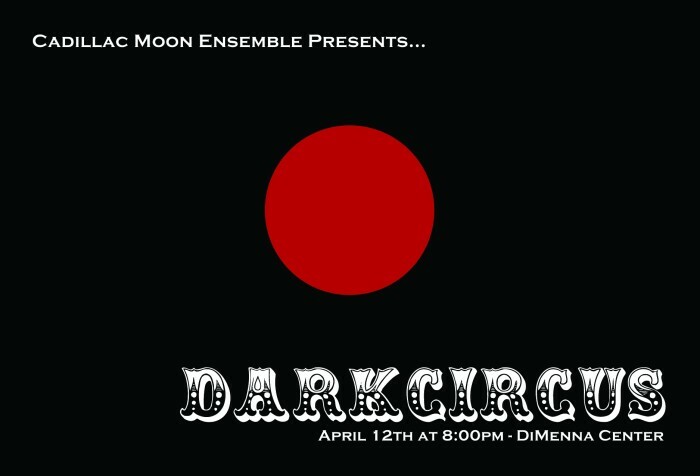 We’re gearing up for our Dark Circus concert next week on April 12 at DiMenna Center, and we’re fully delving into the creepy side of circuses! We’ll be premiering four commissions by composers: Rick Burkhardt, Nicholas Deyoe, Daniel Felsenfeld, and TIm Hansen. As you can see, we’ve already had our clown nose fitting. Conrad Winslow has been working with members of Cadillac Moon Ensemble since his time at NYU hanging out with Patti and Sean in 2008. After having Patti play violin on his master’s recital and a couple productions of the rave-reviewed 2010 off-broadway musical musical named Camp Wanatachi and writing a piece for Sean’s percussion duo Noisebox, we decided it would be awesome to commission a piece from Conrad for our Set in Motion series. Since commissioning Abiding Shapes in 2012, we’ve performed it several times in New York City and also in Portland, Maine! The really great thing about writing for friends is that you feel less awful when you overshoot. I turned in a percussion part that required Lord Shiva arms, but I told Sean that I was aiming for a multicolored array that I knew would require some tailoring. So Sean worked with me to make it fit his (two) hands and his foot, cutting and adapting bits to suit the passages best. Roberta, Patti, and Meaghan, too, let me mold their parts through rehearsal. 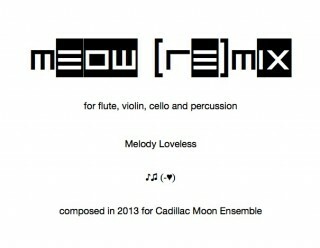 Cadillac Moon Ensemble totally gets the need for revision (thank God) and their resulting commissions are better for it. Most commissioning ensembles expect bespoke work, but fewer understand how much of their effort—and how much revision by the composer—is required to get fitted for their pieces. When it happens it is the best thing. Cadillac is sounding glorious, and it’s been immensely gratifying to watch my piece, Abiding Shapes, develop over several performances into something more polished, more taut, and more beautiful than I thought that I had at the première. 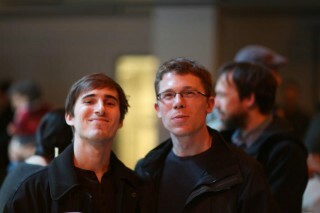 Conrad and Sean at the New Music Bake Sale.